Ometepe is Nicaragua’s figure of ‘eight’ shaped island. 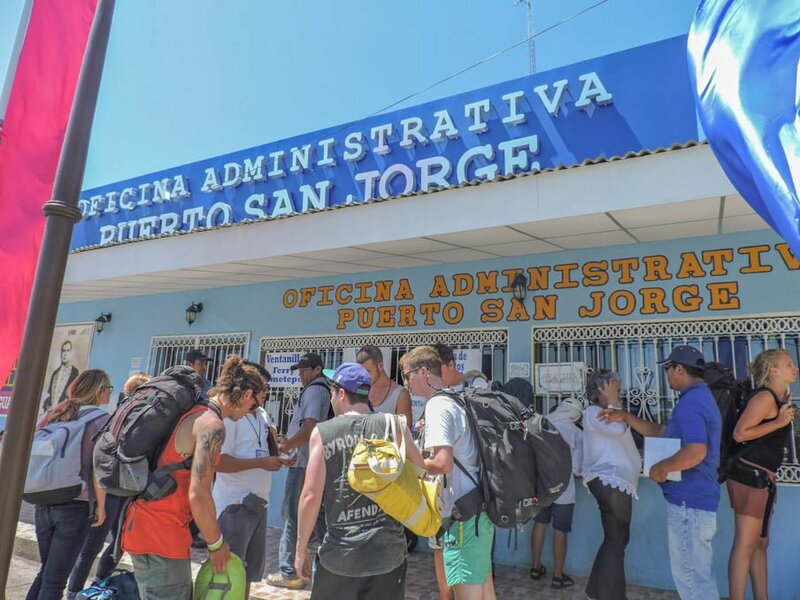 Surrounded by the Lake Nicaragua and home to two of Nicaragua’s volcanoes, there so many outstanding things to do on Ometepe, so it’s clear to see why so many backpackers make their way to the island from San Jorge port near Rivas. Click here for a map of the island. 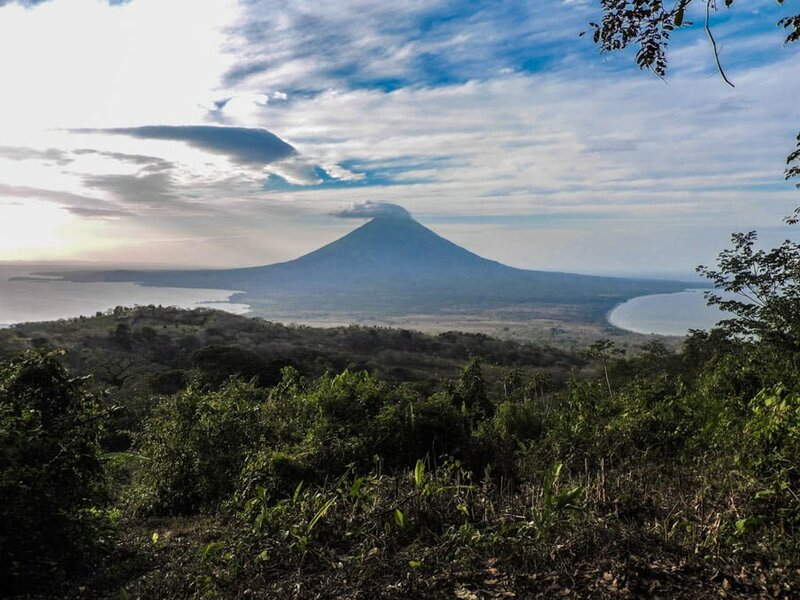 Ometepe is home to two dormant volcanoes – Conception, the bigger one, and Maderas. Conception is best reached from the Moyogalpa side of the island, where as Maderas guided hikes are cheaper from the south of the island (Balgüe / Merida area). Conception last erupted in 2012 and Maderas, over 3000 years ago, making it dormant. Conception is a hot hike, take lots of suntan lotion, Maderas is mainly under rainforest, but very muddy! It can get a bit chilly so bring a jumper however; I still managed to get burnt during the lunch stop. Guided tours may start at Finca Magdalena and end at the El Porvenir farm, lasting around seven hours. It is common to spot white-faced monkeys, howler monkeys, and sometimes even snakes! Ometepe is actually pretty large and the limited transport system makes it difficult to move around. 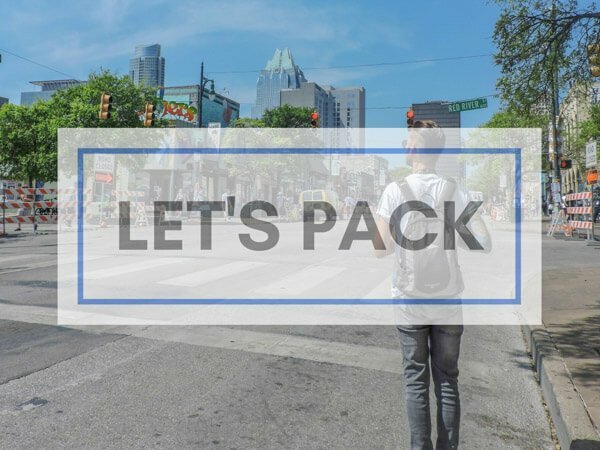 Backpackers are held hostage to their area of choice unless they hire a bicycle, scooter, or motorbike. All three are cheaper to hire in Moyogalpa, for example, the daily price for motorbike hire in Moyogalpa is $20 compared to $35 in Balgüe / Merida. 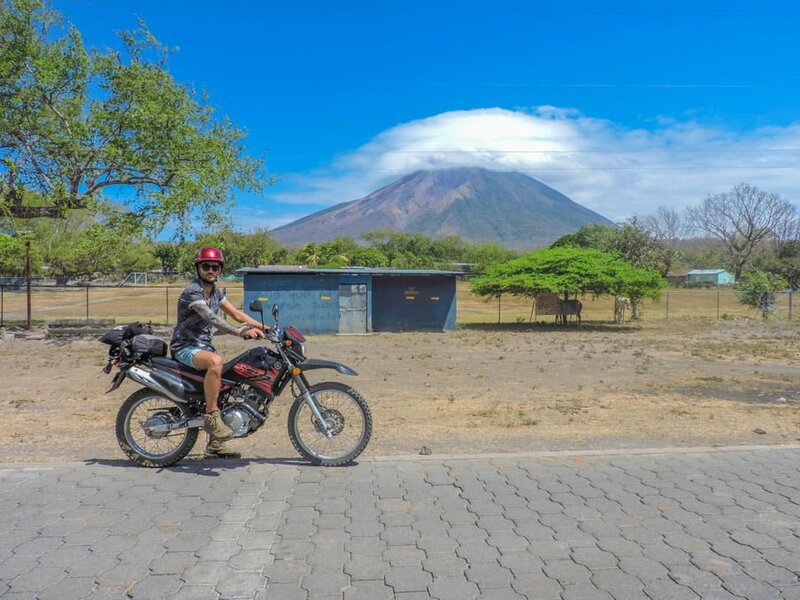 With the wind in your hair and the gravel under your tyres, biking really is a liberating way to see Ometepe’s wonders. Be warned, the island is hot and hilly so bikes without engines are for the fittest of the pack! 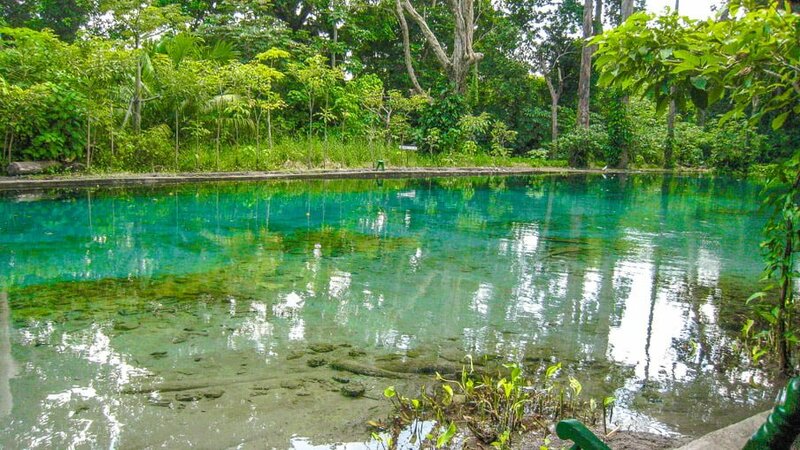 This watering hole is perfect for swimming. Ojo de Agua (Eye of the Water) is well maintained and offers rum in coconuts, as well as glistening turquoise waters. The brave amongst us can tackle the Tarzan swing! Ometepe has had a fair bit of cash injected into the island and this is evident from the RUTA (European Union) symbol splashed on uniforms and displayed on shop walls. 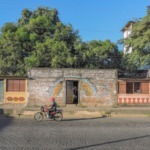 There is a neatly bricked road which runs from the port town, Moyogalpa (where you get off the boat) through to Balgüe where many of the popular accommodation hot spots can be found. This paved road discontinues on the road to Merida; this is where the hiring of a motorbike would be advised, as the road is very bumpy. 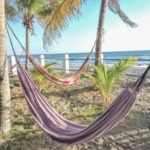 There are lots of cafes, restaurants, finca farms, and even a beach (Santo Domingo) along the way. Rancho Merdia seemed liked a really chilled out spot, we had a drink there. We were told the best sunsets are viewed from this area of the island. Warning: this is a seasonal activity. Do not waste your money in dry season (February to March) as there is no water in Rio Istián. Wet season promises bird watching and caiman spotting while you kayak through the swamp water right of Conception. In dry season you can expect a very choppy fight against the water (think training for Skookumchuck Narrows, Canada) to the arrival of a dry water bed then a walk around what should be Rio Istián. San Ramón Waterfall, or Cascada San Ramón, is located at the southern slope of Maderas volcano. The access point is at the Biological Station and involves a 3km hike, 2km of this can be accessed by wheels, but the final 1km is a trickier path so must be done on foot. The bus from Managua Huembes terminal (southbound) to Rivas should cost you $2.50 / £1.75 maximum. We were ripped off at charged $15/ £10 along with the other backpackers on the bus. This was our own fault for allowing the bus guys to pull us on the moving bus. Two girls were also charged $5 / £3.50 per backpack on top of this ridiculous charge. On the way back we paid much less! The bus stops in Rivas on the side of the road, there will be taxis waiting. Do not pay more than $1 per person. This taxi takes you to San Jorge port (approximately 15 minutes). There are two types of boats from San Jorge port. The ferry is larger and far more comfortable than the smaller boat, which is called a lancha. Life jackets were available on both boats. Both boats port at Moyogalpa. Backpacks can get wet if riding the lancha on the top deck so bring a bin bag or similar. Older blog posts say you can pay for the ticket on the ferry, this was not the case, we did however pay on the lancha (on the way back). Both boats were approx. 70 cordobas / £1.74 each and take about 1 hour. The companies that run these boats follow strict weather guidelines. There is plenty of choice of accommodation all over the island. 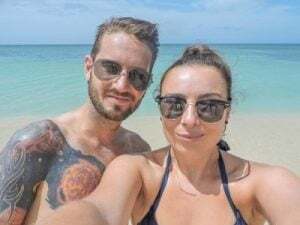 The best advice we were given was stay one night in Moyogalpa to suss out the weather on the island and ask around for tips from travellers who are leaving. Our first night was spent at Hotelito y Restaurante Aly, which was way cheaper than the competitors. Have you been to Ometepe? Any questions, fire them below as always! You had me at that watering hole! Also, I hiked a volcano while I was in Costa Rica last year. It’s not for the faint of heart! But definitely not has hard as that trip with Alpaca Expeditions was. 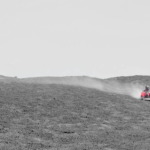 Craig looks like he was born to ride a motorbike in that picture… haha! Sounds like so much fun! He really was! We’ve decided to get a bike when we get home / get some cash to see more of Scotland, how cool would it be nipping away for the weekend in our leathers!! 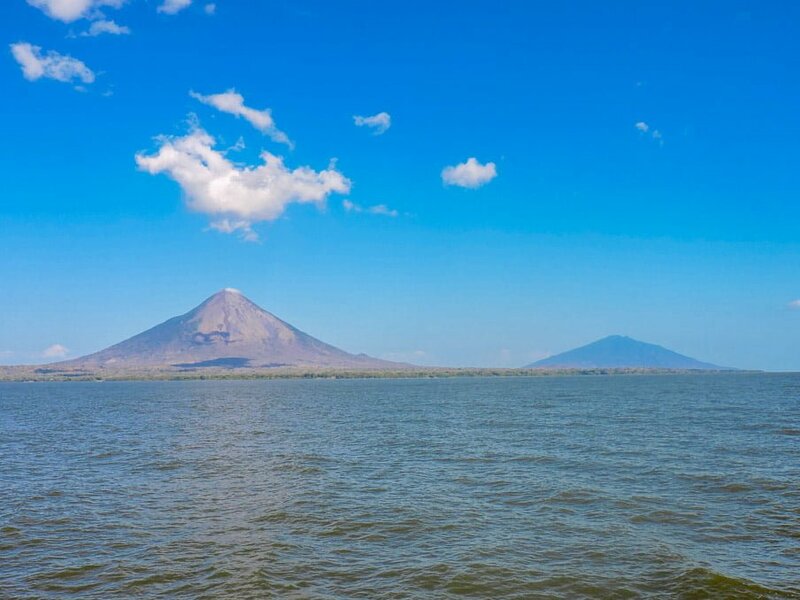 First time I read about Ometepe, It is wonderful place to spend holidays. Very happy to do introduce you to the island! Way cool guys. We missed Omotepe as were holed up house sitting in Granada. Nicaragua is a freaking gem. Like the new Costa Rica, with many similar beauties, but infrastructure is slowly picking up. Fun share! Definitely one of the fun parts of the trip, heaps to do! A bit pricier than other areas though. Granada was beaut! Spending a week on the Caribbean coast, then MGA-Leon- Las penitas. Not entirely sure I want to shave off a day or two to travel from Las Penitas back to MGA then Ometepe. 3 nights at LP and one on Ometepe. Don’t want to chance two nights due to the ferry situation. What do you recommend? I have hiked volcanoes, swim, kayaked, and all of that in other locations. ha! Good advice– I dunno. I can’t garner much excitement about it, Ometepe. I live in Colorado in the mountains with a snowy winter so I can handle some beach time. Maybe I’ll check out LP for a night and see how it finds me. Where did you guys stay there? Any recs? 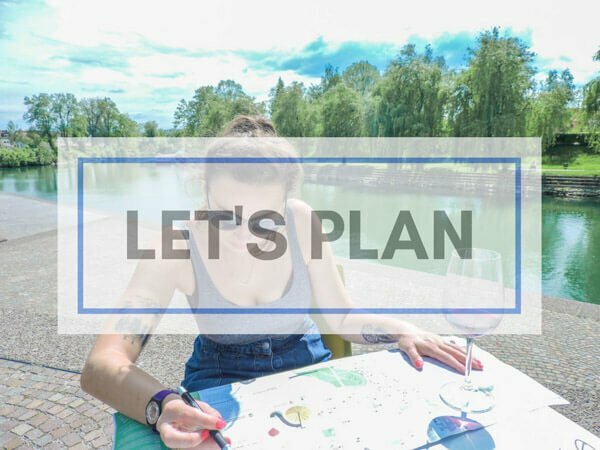 That sounds like a plan. 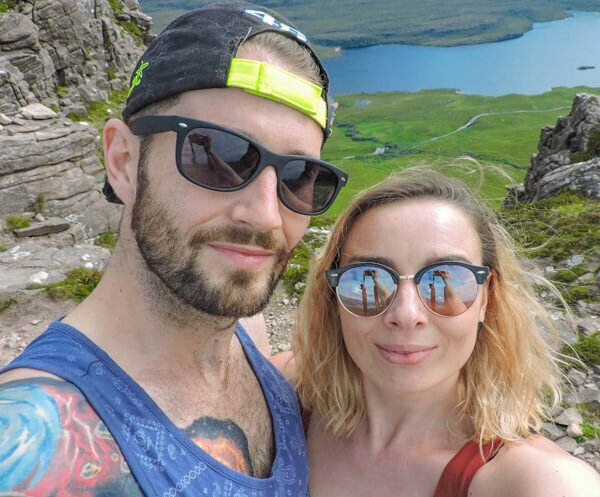 We worked / stayed at Simple Beach Lodge which is nice but a bit pricier for backpackers, quite a few couples book there when needing a break from the hostel life so it depends on your budget – there’s a list of other accommodation here which you might find helpful, along with restaurants etc! I will be in Nicaragua later this week. I am only doing Granada and San Juan del Sur. But I think I need to make a day trip to ompete. Think renting a scooter head to ojo de agua and then take the path you mentioned towards the waterfall for a hike. Is there a place to keep scooters (safely) while hiking? Thanks so much for such an informative article! 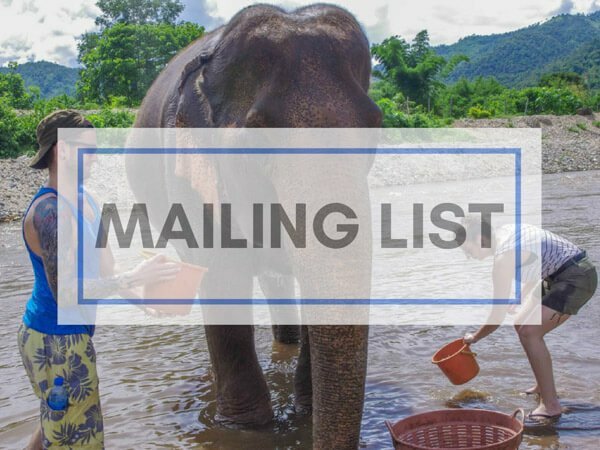 We’re planning a trip to Central America this spring, and your photos are getting us really excited! 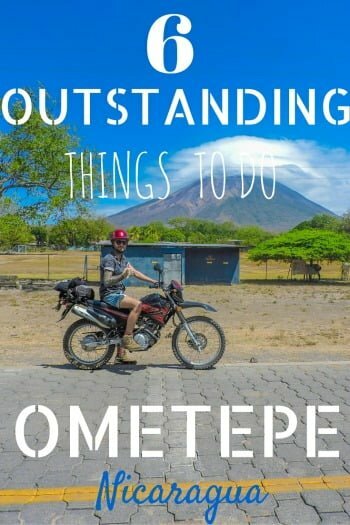 Ometepe will definitely be on our list! It was a lot of fun. Definitely hire a bike to get around! We actually spent Christmas here, staying in Moyogalpa, which was interesting, Christmas Eve itself seemed to be a huge celebration in town. What was your opinion on food options on the island? Value/variety/taste? 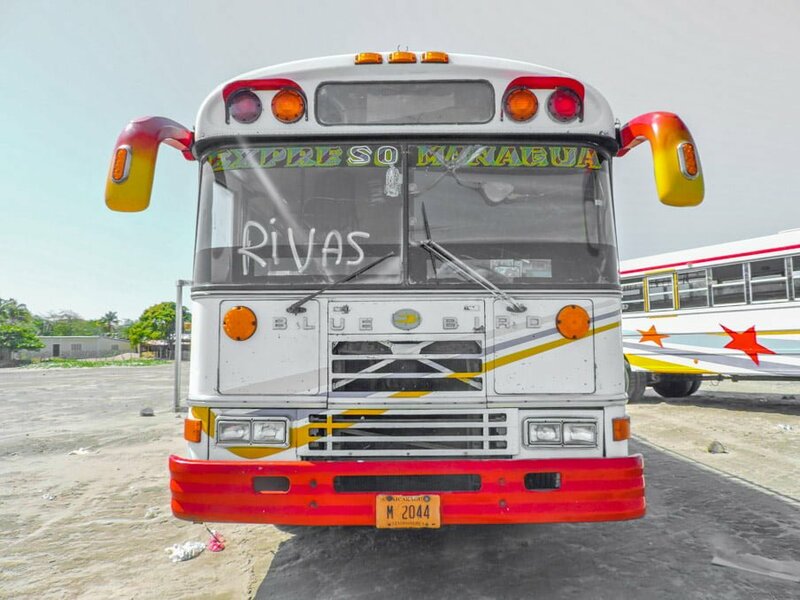 The bus helper tried to rip us off for bus fare from Rivas to Managua, but not as much as your experience of $15! There is ALWAYS another bus right behind the one you are being rushed onto, and ALWAYS ask a local what the fare is before the bus leaves. In El Salvador the maximum bus fare is posted, which is so nice to see. Christmas, wow! Food wise, because we had the bike we had the chance to sample a few options which were pretty varied. Had a great Mexican just on the street running up from here the ferry terminates. I learnt that bus lesson quickly. Although I also got ripped off in Istanbul by a taxi on day one… To be fair one country out of the amount of travel I’ve done this year isn’t bad. I did feel pretty vulnerable after it happened though.